Do you know how crazy it is to think that I was applying to college last year? I can't believe it has been almost a year since I got into my first college. College applications can be so stressful but know that in the end, it is obviously worth it. I feel like I know so much about college applications between my brother and sister applying, my mom helping people apply, and then actually applying myself. I hope my these tips can be helpful for you! I talked about where I applied in my post about state schools, but here is a little more information. I applied to four schools: Alabama, Kentucky, Georgia, and Clemson, which was the ordered I applied to them. Alabama's application was super simple, and it honestly took me about ten minutes. Then there was a separate honors college application that had four essays. Kentucky had one essay, and then the honors college application had one or two more essays. Kentucky also required a teacher recommendation. Alabama and Kentucky both had rolling admissions. I applied to UGA early action, and there were no essays for the early application. I just had to fill out a resume portion. I found out about UGA in November. Clemson was a similar application to UGA, but I found out in February. DO: Apply to your dream school | This is something I regret not doing. If money and location were not factors, I probably would have gone to Northwestern. It has an amazing journalism school, and I love Northwestern football. Unfortunately, it does cost a lot, and with us not knowing what was happening with my dad and his job, I needed to keep costs as low as possible. I regret not applying though. I wish I had applied and all my wonderings about whether or not I could have gotten in would go away. Even if your reach school is crazy out there, just apply. The only thing you lose is about $60 for the application fee. Just remember: not everyone gets into their dream schools. 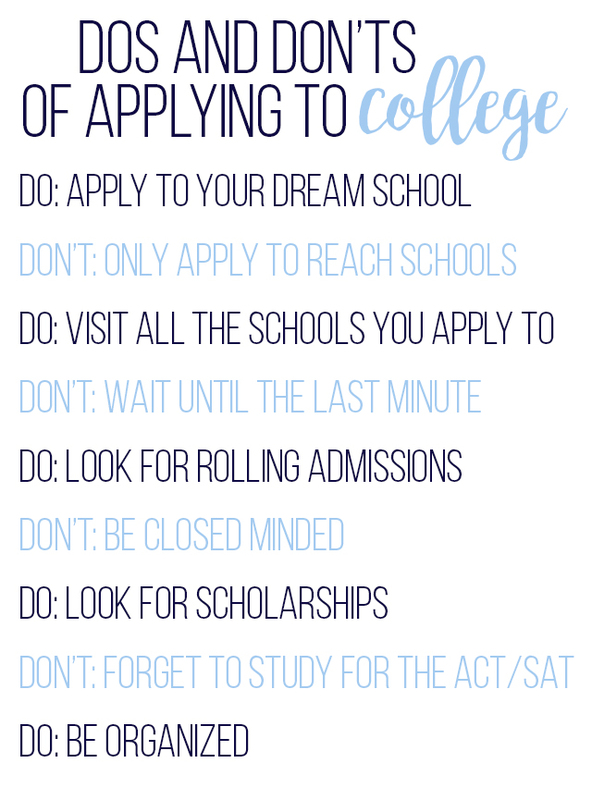 DON'T: Only apply to reach schools | This is the biggest mistake you could make when applying to college. You need to apply to schools that you know you can get into in addition to those dream schools. Apply to a school in-state where you are well above the admissions rates and that you could see yourself there. There's a chance that you don't get into any of the schools you apply to if you apply to only reach schools. Then you're stuck with no plan for the upcoming fall. When it comes to college, you do have to be realistic in certain aspects. DO: Visit all the schools you apply to | How a school feels is super important and can make or break your decision to apply there. I went to a camp at LSU, and I honestly just didn't like the campus that much. It wasn't right for me, so I didn't apply. I visited Alabama the next week, and I fell in love with the campus. That visit also completely changed my mind and made Alabama my #1. The only exception I had for this was I didn't visit Clemson after I applied for two reasons. 1. I applied to Clemson really randomly because I was having a "mid-life" crisis about college, and I was about to apply to a ton of schools. I ended up only applying to Clemson because the crisis was over pretty quickly. 2. I decided I was going to Alabama pretty quickly after I had applied to Clemson. DON'T: Wait until the last minute | Send your applications in early!! Get them done quickly. Don't wait until 11:30 the night the application is due to start it. You're not sending in your best work at that point, and you really need to be putting forth your best effort for applications. A former student of my mom's called her at 9:30 and asked for a recommendation that was due at midnight. Did I mention I had the flu and a104-degreee fever when this happened? Thankfully my mom is a really good person, and she wrote his recommendation while I was in the next room practically dying. DO: Look for rolling admissions | My biggest tip is to find a school that offers rolling admissions. Rolling admissions is when you apply and then you find out your application status within two weeks to a month. Alabama and Kentucky both offered this, and I found out about Alabama in September and Kentucky in October. This was really nice because I was the one of the first people to know that I had gotten into college. It was a huge weight lifted off my shoulders because I knew I was going somewhere. I think finding a safety school that offers rolling admissions is a really good idea, and I know some state schools offer it like Bama, UK, and Auburn. DON'T: Be closed minded | It is super important to keep an open mind when looking into colleges. I was dead set on a place for the longest time, but then I found Alabama. If I hadn't been willing to visit Alabama with my parents, I would not being going somewhere that I love. It's okay when plans change, and you need to be willing to let that happen. DO: Look into scholarships | College is expensive. First, look into academic scholarships. This is where you can cut down on tuition pretty easily. Definitely make sure you test scores are high for these. Then you can start look into outside scholarships, which are great for paying for housing and books and all that. Als,o make sure to fill out FAFSA once it comes out in January too! Once the FAFSA money is gone, it is gone. DON'T: Forget to study for the ACT/SAT | Speaking of tests... Don't be like me! Study! These are super important especially for scholarships like I said. At Alabama, all the scholarships required a 3.5 GPA, and the different levels were determined by test scores. Also, take both of them. I was determined to only take the SAT even though I was not doing well on it. Once I finally took the ACT, I did so much better on it compared to the SAT even without studying for it. Then once I studied for the ACT a little bit more, I got the score I needed for the highest scholarships. DO: Be organized | I have a whole post about prepping for applying to college. Being organized is super important especially if you are applying to a lot of schools witha ton of different deadlines. Make the process easier on yourself and keep yourself straight. If you are applying to college, good luck!! It's such an exciting time for y'all. Be sure to check out Dorothy's video too.